Every year on July 16th, the city of La Paz celebrates its independence from the Spanish Crown achieved during the La Paz Revolution. On Sunday, July 14, 2013, the Prada was closed to traffic and people lined the streets for a pre-celebration parade. Half way through the parade, creative artists reminded us of the recent uproar over the closing of airspace to President Evo Morales. 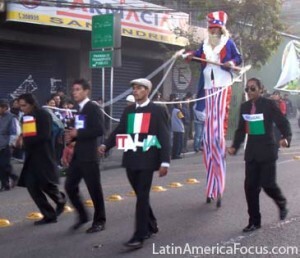 Sporting red, white, and blue, U.S. President Barack Obama was portrayed on stilts towering over leashed representatives bearing the flags of Spain, France, Italy, and Portugal. On July 2, 2013 Spain, France, Italy, and Portugal denied airspace to Bolivia’s President Evo Morales’ plane, forcing a diversion to Vienna, Austria and preventing his immediate return from an energy summit in Moscow. Several Latin America countries appealed to the Organization of American States (OAS) to declare the incident a serious matter, demanded clarification on the issue, and questioned whether the U.S. instigated the incident in the belief that NSA leaker (whistle blower) Edward Snowden was on board. Since the July 2 incident, Bolivia has threatened to close the U.S. Embassy and on July 8th, thousands gathered in protest outside the U.S. Embassy in La Paz. The July 14 parade reminder shows that the plane grounding is not easily forgiven. Read a full summary of events surrounding detention of Evo Morales and the impact on U.S.-Latin American Relations.